From organising hives and apiaries to tracking inspections or honey harvested, to information on queens or where a piece of equipment is being used, BeePlus is designed to help you look after your bees, using as much or as little detail as you need. Next to worthless - I can keep better notes on the spiral notebook. When out in the field and working multiple hives, writing notes wearing gloves and suits Is nearly impossible. I can write and keep better notes on the top of the outer cover using a sharpie. Good app for tracking hives! - I’m a small scale beek and the tool works well for me! Good basic function - Happy with the app so far, using it for a half dozen hives. Only desire so far would be to organize inventory items by class, even if acquired on different dates, date it less important than item type for setting up hives. 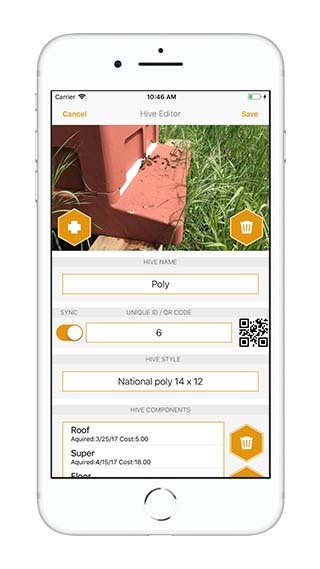 A real “honey do” of an app - This is the easiest beekeeping smartphone app. Records can be entered in the bee yard or office. It’s easy to see what you’ve done and what needs doing. It makes planning much easier. Good-just missing a few features - This is a great app to use, as long as you have a protective case for your iPhone/iPad or have an old one you don’t mind getting covered in propolis. Most things you usefully want are covered although possibly an enhanced queen rearing section would be useful. However the key missing feature is an automated/iCloud backup and sync across multiple devices, rather than the rather convoluted manual process. If and when this is added it will be a five star App. Very Useful - Very clear and easy to use. You can store as much or as little information as you need and easy to read back over past notes. Useful and easy tool, one suggestion. - I only have three hives, so record keeping is quite simple as it is. Therefore, I do not use or need all of the features this app appears to offer. The app makes it simple and fun to record what I did, when I did it, and the condition of the hive. I especially like the photo adding features. Works well on an iPad. I would like to use the easy frame counting feature (how many have larva, capped, honey, pollen, etc.) while working the hive, but it’s too hard to use my iPad while holding frames. I skip that part and just record what remember after I’m done. Obviously a helper is necessary, but adding really large buttons for toggling the numbers up or down would help. Or, perhaps a way to make an audio recording which can later be transcribed into the log. Request - I just started w app and it looks great. It would be useful to include a place in each hive to record the weight of the hive on a regular basis. Or is it already there and I missed it? Thanks! 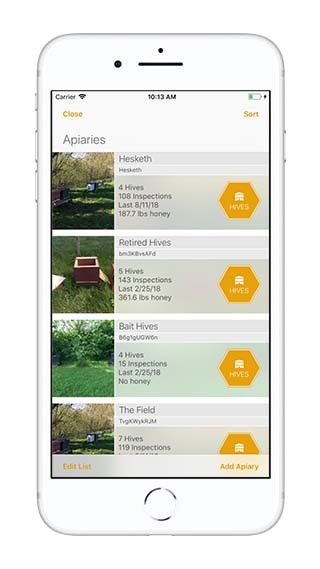 Fabulous app - Helps track the apiary and encourages structured inspections. Works well and syncing between devices is great. There are a few small glitches but nothing serious. Great app! A perfect apiary app! - Try it with an open mind and you’ll quickly realize this app is a valuable tool that will work for you, the keeper. I’ve used spreadsheets, notebooks and my memory - all don’t come close to the information you can store and access to better your house hives. A must-try! Excellent Apiary recording tool - Been using this for 2 years now and am quite pleased. Developer continues to tweak the app to make improvements. Like the mapping helps keep apiaries separated. I have a horrible memory so this helps keep things straight. It helps keep track of queen linage and I can see which of my queens are marked so I know what to look for. Like the inspection record section. Check boxes for queen, eggs, larva and brood. Also has place for qty of frames of honey, brood, open (drawn comb), and foundation but would like to see how many frame of each type are in each box/super. This is the best app I’ve found for apiary management. Serves most of my needs. I am not affiliated with the developer or anyone else associated with this app as one reviewer suggested. I like it enough to use it as an example of record keeping at my local Beekeeping association. Fun bee app! - This has been a really fun app to use to keep track of my hives. It’s easy to learn, and allows me to pack a lot of solid info into one convenient place for reference. Allowing me to store pictures is also a benefit! I LOVE this app, and HIGHLY recommend it for fellow beekeepers! Weekly Records & more - Fabulous app, great design and meets all my needs. Brilliant you can record pictorially and write notes for reminders, can export data. Great app for hive management - From a backyard beekeeper who keeps anywhere from 5-20 colonies and raising nucs for sale this app is working out great. Still take a notebook to apiary but now enter all relevant data into app and have all information at my fingertips. Primarily I use the the hives and inspection records. A lot of the functions I don’t use but I can imagine they would be quite useful. Great app at a low price! - This is an awesome app for the price. Not sure that it’s the most user friendly app to work with as doing tasks isn’t as straight forward as it could be but still pretty rock solid! Start using the bee app - You should start using this bee app! It only takes a few moments to document your hive activities and add a photo or two. The app’s configuration is easier to use than ever (after a short learning curve). I wish I would of used this app from the start instead of trying to remember what I did when, how my hives looked and their conditions. terrible and difficult if use - I am not one to leave reviews, but these reviews are false. All the great reviews are from either staff who work for the developer or are just nuts, and have never looked at other apps for hive management. The inventory section has Nothing, must write out each item vs. selecting from a list of standard items. Basic hive inspection items do not exists either. The app only provides a place for notes. When I am completing an inspection with a suit, gloves, HOT sweaty, I need something ready to go. I have a number of hives to move thru. Have many, tasks to complete. I need an app with all the questions of a inspection, as I want to get finished and not waste a large amount of time trying to write down these basic items only to forget to review items because the app does not have a list of inspection items to be reviewed. Found It - I have been looking for a apiary software that kept the records I want, but wasn’t 2 cumbersome. Something that also could be used on the fly. BeePlus answered my request. I can track costs, honey production, setup schedules for my hive maintenance and everything. It’s easy to use, and I can use right in the field. It’s a great product. 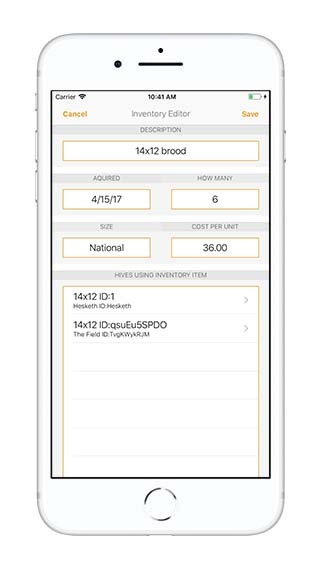 Great tool - Love it, only things I would change is when assigning inventory to a hive it is a bit of a pain to have to add a frame 20+ times one by one and the other is I would like to be able to have unused inventory assigned to a “home or warehouse”. But I really enjoy the app other than those small details. Love this app! - Helps me track my spending, inventory & eventually profits. Well worth the money! Awesome! - I’m going on my fourth year as a beekeeper and I’ve used this app for one entire season and absolutely love it! With ten hives over two apiaries (and growing) this app makes me a more successful beekeeper. Great! - Allows easy charting on hive status and honey production. Also has great charts to show cost vs profit and inventory. Excelent apiary recording app - Well tailored for tracking the items a beekeeper look for. Must have been designed by someone with apiary experience who had the end users in mind. Fairly intuitive to learn. I see it as Scalable from a few hives to hundreds. Well put together app. Great feature set. Excellent - Great features: calendar can sync with other calendars, pictures and description of common pests. Easy and fast to populate spreadsheet for hive inspections. I have used it for two hives and live it. It works - This bee keeping app works for my urban Apiary. New beekeeping - This is my first year beekeeping and I like that I can keep my records all together on my phone. Very well done! 1st yr-Amateur - This app has been helpful for me to focus on specific items when checking on my hives. My apiary expanded quite rapidly this year & along w/learning the beekeeping basic skills I began to stress about how to keep the details of each colony of the inspections separate. It's user friendly & had been great use for logging all data. Great - This is a fantastic app to track hive activity for the novice or professional beekeeper. Greate app. So few on this subject too - Really useful app and surprisingly so few on this subject. A lot of thought has been put into this allowing the user to record majority of the important information. I was getting to the point where I thought I might have to write one myself and then I found this! It would be great to have an app like this that was voice activated. Enabling the user to call out the apiary and the hive number / name. The user could then call out key words like feeding, treatment, brood health etc.The user could then use the app hands free while on site. This was my idea of an app but it is quite a big ask but I'm sure we will get one like this one day. Useful but not always intuitive - A very useful app to keep track of my small number of hives. It's not as intuitive to use as I'd like, and I can think of some useful features that ought to be fairly easy to add (such as being able to enter hive type, indicate more than one kind of weather and flag up a particular hive for special attention on the next inspection, for example), but I find it much easier to use this than a paper notebook. Well thought out app - This app has been invaluable this season. Much better than the notebook I was trying to maintain. Lots of tiny flourishes within this well thought out app that makes it a pleasure to work with. Bee Plus - What a fantastically simple and effective app. Prompts for all the key information when doing inspections. Easy to reference notes for when you return to that hive. Picture capability, maps integrated and a generous amount of other useful info, such as disease and pests. Great Tool - I'm new to beekeeping and this is a great tool for keeping track of hive conditions and the to do feature helps keep track of upcoming tasks. Useful app for keeping notes - This app has been useful to me for tracking my activity in my hive. I'm just getting used to the app and probably haven't made good use of all the capabilities of it, but just having an easy journal to log my inspections in is great. Great app - Love the app. Very useful. I would like to see a way to delete to do lists and inspections that were added by mistake. What i wanted ! - Had another app first , it worked a few weeks and then I couldn't use it till i paid a $50 fee , since i had entered all my info on starting my hive they had me . Wrong ! So .. i found this app and no fee ! Took a bit to figure it out but its just what I wanted in the first place ! Simply brilliant! - I've been using this app for a couple of years now and it's made my beekeeping much easier. Simple, easy to use with all the sections you need. Only downside is getting propolis on my iPhone!! Excellent app - This app can handle most of my requirements. The only thing that would be helpful would be to separate the count fields across multiple brood boxes as well as accept decimals in the count (to record part frame counts). Excellent Beekeeping App - Great app for tracking what is happening in hives. Really like the syncing feature, and that I can add photos. Great except for the latest update - App is fantastic for a bee journal. Easy note taking with everything you need built in. Worth every penny. Developers respond quickly to issues (I've only had one after an update and it was fixed within a week after I rated it). I highly recommend this app, as a new beekeeper it has been very helpful in letting me know what to look for on inspections. Love the app - I have several hives and this app helps keep me organized from the equipment on hand to the honey I've pulled. The best part is the quick hive inspection updates. A quick review of my last inspection and I have an idea what to expect and plan what to look for. A must get for new keepers. Great tool - Really great tool with the sync feature and QR codes I could see this would be amazing for a larger bee keeper. It super useful for keep my inspections and remember things between inspections with a busy working life aswell. Brilliant - Love this app, it's made my record keeping so easy. Just email yourself the data and you have a written record of everything. Love this app - I was originally hand bombing all my notes into a journal but I started to loose my book. I realized I always have my phone with me so why don't I check out an app, that's when I found this one. It's efficient and keeps all my info organized. It works perfectly for my 20 hives. Good App - Like everything about it but the notebook section. It keeps shutting the app down. Bug fix? Great app so far! - I have been using this app for a few weeks now and it is definitely helping me keep track of my hives. I tried to keep a notebook and write everything down last year but this makes keeping records so much easier and quicker, pull phone out and add an inspection record to the hive your working, beats the heck out of carrying a notebook around to do it. I found the map that shows your apiary(ies) and the forage area to be pretty neat. The ability to add pics of each hive is very cool and the ability to add a picture an inspection is a great feature too. Awesome App - Always improving and quick to answer questions!! Lots of progress to a good app - BeePlus works well. Over the past year there have been significant updates - with more, I understand, to come. I tend to use it with dictation in to the Notes field while I am at the hives then tidying up and completing notes once back home ... because touch-screens and honey etc. don't go very well together! But the app works well on both iPad and iPhone and the record-export allows me to store records in a conventional filing system too. Great app - Does everything I need it to do and more. Wouldn't be without it. Bee warre - Use this app with number of Warre style hives even though not specifically designed for them is great. Love the ability to sync with my partners phone. Impressed - Very impress with this app. I'm hoping it maintains its current features and improves even more in the future. Very well done. Fantastic app - Very easy to use and has helped make my hive management and record keeping easy. Fix the inventory - I love this app in almost every way. It does a great job of organizing your whole operation. That said, there are some flaws I would like to see fixed. First, my inventory list copied 8 items and reproduced about 500 blank listings for them. I managed to delete them all, and they reappeared the next time I opened the app. The map is also a little wonky. The interface for creating a hive and adding its coordinates does not work. You have to pick coordinates on the map and then create the hive. It also does not project the foraging circle around each hive. Only at the first hive you create. Time will tell!! So Far, So Good - My husband and I are new to bee keeping and I just downloaded this app (without reading the reviews) & I put our apiary & hive info in, along with some notes. So far, I think it is awesome! I sent an email suggesting some selections for new installations of packages/colonies/hives. Other than that, so far, I really like it!! Upon writing my review, I read some other reviews & I am a little nervous about loosing my info but, if all I loose on updates are my pics that is fine. I just don't want to loose the IMPORTANT stuff like ALL the notes and dates! We are taking a class on beekeeping and I am going to tell everyone about the app! Only time will tell exactly how I feel about this app but, as of right now, 5 stars!!! Awesome - This app has everything. And they upgrade along the way. I highly suggest this app. I keep track of all my hives and swarms and even the backyard bees. Especially when placing hives in the country. 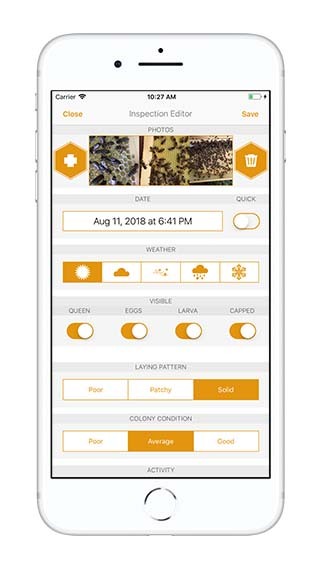 Great app for the beekeeper - I currently have 6 hives that I move to different sites throughout the year and I wanted to be able to keep track of which is which and what was going on. After a few weeks I was amazed at how often I looked back at previous notes and inspections and was able to get valuable information that I wouldn't have remembered or confused with another hive. Useful app - Good competent app for beekeeping records. Not much to fault. Pretty good tracking app - Obviously you need ungloved hands to use your phone, and there's no option for miscellaneous notes. I.e. I wanted to stock take but not link to a specific apiary or hive. Other than that it keeps a helpful record without having to worry about pens and paper (or multiple sheets and locations etc). Handy. Brilliant tool - This is perfect for me. I'm new to beekeeping with only one hive but even so this is set up to allow easy expansion. It's intuitive and quick to record an inspection and to read back through the records before opening the hive. It's really nice to show to non beekeepers to explain what you do when inspecting. Nice App - This does more than I need right now, but I will need it later. I like that it keeps the data at home too. Helpful and intuitive - I have been using this app for a few months now and am enjoying it. Easy to input all the relevant basic information, and easy to scroll through past inspections. Now one can add pictures and search for data within date ranges. The app team are personable and respond to input and enquiries often with updates. Recommended. Very nice app - I'm loving the latest version. Good layout, very functional and easy to work with. A useful tool and simple to use. - Having used this for the 2016 season we have found this a useful tool to track our inspections. We are able to input valuable data that is easy to review, pictures can be added to further enhance the records. 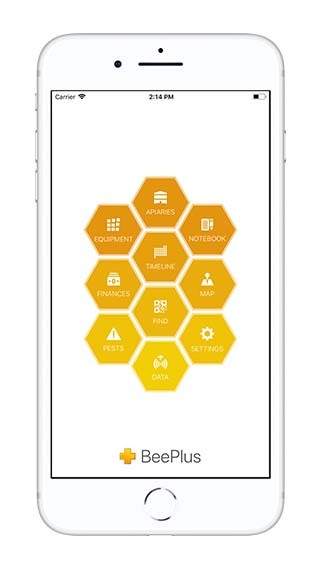 The app allows you to pinpoint apiary sites add things to do and add additional notes. Individual hives can be added to your apiary sites and records are neatly stored under their own title. You can also have multiple apiary sites in your records. The app is being developed all the time with free updates as and when made available this app is free. If like me you have an iPad and iPhone the records can be shared and updated via wifi. We have incorporated a picture of our medicines purchase and administration records for each hive as an additional back up of the paper copy these records need holding for 5 years. There is some limited guidance on diseases. We tend to make paper notes on site and update our records over coffee propolis on an iPad isn't great. In conclusion this app developed by bee keepers gives a great starting point for what records you need to keep and allow for additional notes as you feel fit. It works for us. Sweet little App - I actually enjoy using this app to record my dealings of my hives. The quick radio buttons and ability to add photos is brilliant. Nice, quick and easy! Great Hive management app - This is a great app for someone with a few or many hives who just wants the right amount of detail and wants to avoid too much complexity. Love the photo and map features. Running 15 hives this is great. Tried the others but this one is short sweet and simple to use! Keep up the good development work. It's free , but worth a few bucks! Really good... - I am a new bee and I have used this nice little since June. I have to say it has improved a good deal, I like the fact that you can more than on pic and also the inspection summary, the colour coded layout is much better to the eye! Thank you! Happy Beek - I am more than happy with this app. Very user friendly, easy to enter data. As a development I would love to see some data transfer via email. 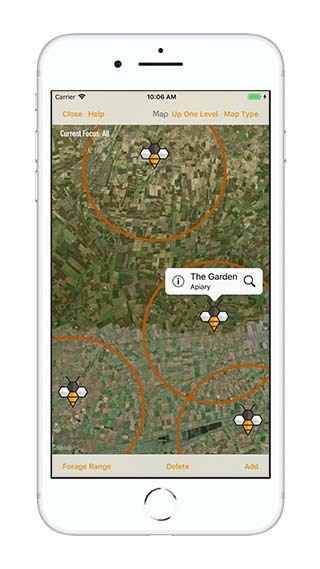 Beekeeper app user friendly - Have just started to use this app. 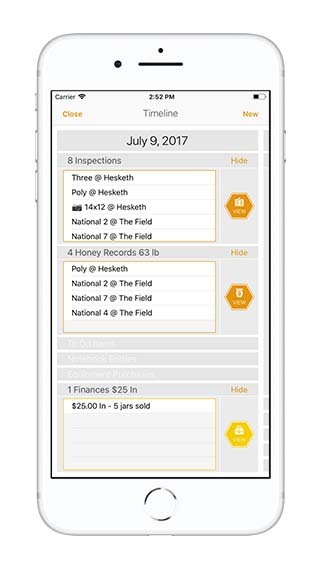 The developers have enhanced the app application making it easier to use and just what a beekeeper needs to keep his or her records. Great App for Bee Keeping - I'm a "newbie" bee keeper and it's amazing how much information you need to consider in managing bees effectively...after all they don't read the books! This app is simple to use, has most of the relevant data sets to collect information about apiaries and hives associated with them. The QR code is really useful as I can easily flip up the data with out going though screen. It easily transfers data to different reports (pdf, excel) and will be very useful for exams etc. Free txt and button style inputs means there is a logical and consistent collection of data. Which means you get a much better understanding of your colonies behaviour and progress. A few more tweaks and additions will make it a 5 star app....Good Job so far! Great App - Let's you input important information quickly for all your hives. Easy to use. Starting to really like this - So easy to use, just started to use this app, I find its just what I been looking for. Keep up the good work. Very nice app. 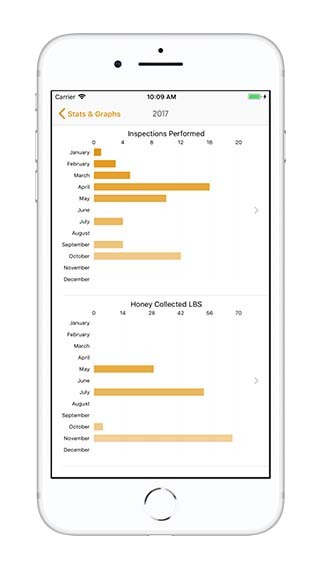 - As a new beekeeper I was very interested in this app for recording my hive data. The app is easy to use and seems to have all the features required. One small issue I have is with syncing data between devices, which seems a little awkward. Apart from that I find the app very useful. Many thanks. Great App! - I'm a backyard beekeeper and this app works great for me! I had a bit of trouble with it crashing at first, but the developer worked with me to find out what was happening and had it fixed right away :0) The app is very easy to use and keeps all of my hive data handy and in one place. Love it! Works for me - Easy to use and complicated enough to be useful. Strongly recommended - Great app From 1 hive to 50 apiaries this app Keeps you organized and on your game. This app is like a second hive tool. A must have!!!! Nicely set out - Great app. Have started using it to keep on top of my Apiary this year. Very straightforward to use. Simple interface. Haven't tried sinking but potentially nice feature when you manage gives with someone else. Crash on startup - Since latest update, app now crashes immediately after loading.